Yesterday at a press conference in Los Angeles, Microsoft unveiled a pair of their own tablets for the very first time: the Surface Windows RT and the Surface Windows 8 Pro. Prior to the unveiling, a lot of rumors were doing the rounds. While some rumors claimed about an e-reader in collaboration with Barnes & Noble, perhaps the most interesting of the lot was that about an Xbox branded tablet. This rumored tablet was supposed to be named Xbox Surface. It was supposed to feature a 7 inch display and support up to 4 wireless game controllers and capable of steaming Xbox Live content. The rumor also reported about specs that were too impressive and eventually they were all proved wrong. There's no denying that the Microsoft Surface is cleverly equipped with the built-in kickstand along with the Touch and Type Covers and the VaporMg case. And having their own line of tablets will allow Microsoft to properly show all of Metro's features. But the intriguing part is that, would it be enough to topple the iPad from its throne of dominance. Although, Eric Neustadter from Xbox Live Operations has tweeted, that the Surface is a full-on PC capable of running true PC games unlike the iPad, there was no mention of any Xbox integration or even Smart Glass during the unveiling of the Surface. Now if the Surface were to come with Xbox integration, then it would have added heavily to the possibility of taking down iPad's dominance. Considering that Sony is already providing PS integrated laptops, Microsoft could have done the same with Xbox support. On the other hand this might be another playing card to be used later by Microsoft. What Microsoft showed yesterday were just prototypes and the finished product could come with more added features. 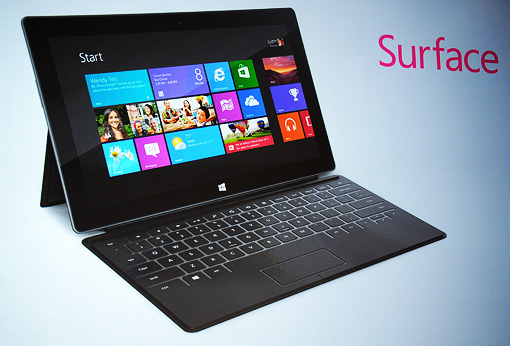 A couple of interesting accessories of the Surface are the 3mm Touch Cover and the 5mm Type Cover. Both attach magnetically functioning as a protective cover when closed, but when pulled down they operate as full touch-sensitive keyboards along with track-pads. Add to these Xbox support, and you'll have a tablet to reckon. As of yet, Microsoft hasn't shown any such intentions but hopefully they might, at the official launch of the Surface.